Few things in fly fishing are routinely as disappointing as your ordinary nippers. This is one of the few product categories that the manufacturers just haven’t seemed to ever get completely right. On the one hand, you have your budget snips, like the Dr. Slick nippers I used for years–usually these are built on nail clipper designs, and while they work fine for heavier tippet, gaps in where the teeth meet and cheap metal mean your chances of cutting anything smaller than 5X cleanly soon dwindle to nil. On the other hand, you have your expensive clippers, like the Fishpond Pitchfork model (the most expensive ones I’m aware of at $22, pictured). 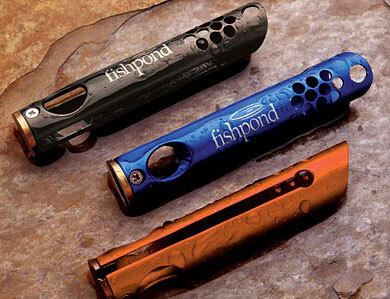 Fishpond’s Pitchfork is advertised as a long-term solution with stainless steel blades. While Fishpond’s products are usually excellent, I haven’t gotten any longer-term use out of my Pitchforks than any previous pair of much cheaper nippers (usually, about a year before I start cussing every time I tie on a fly). This is especially frustrating as the Pitchforks have removable blades (which could presumably be sold much cheaper than the machined aluminum body), yet these blades are not available separately. Blade technology is not expensive: disposable razorblades make it obvious that cheap, sharp cutting solutions are out there. What we have here is a golden opportunity for a savvy product designer to come up with a system of *replaceable* nipper blades, possibly on a system like the Fishpond Pitchfork. Any sharp edge will eventually wear down, and anglers clearly don’t mind paying for a quality product: someone needs to provide it. Do you bite the tag end off your #22 midge knots with a single, razor-sharp tooth, kept carefully filed each night? Know of a pair of nippers that miraculously will not wear out? Let us know in the Comments section!